MELBOURNE (Reuters) - Roger Federer's bid for a hat-trick of Australian Open titles was crushed on Sunday as Greek wunderkind Stefanos Tsitsipas rose up to floor the Swiss master and become his nation's first Grand Slam quarter-finalist. "Roger is a legend of our sport, he showed such good tennis over the years. I have been idolizing him since I was six. "I didn't lose my patience, stayed in those rallies. It was very important to save those breakpoints." "Definitely didn't go the way I expected with the breakpoints," Federer told reporters. "I have massive regrets tonight. I might not look the part, but I am. I felt like I had to win the second set. Cost me the game tonight." "He has a one-handed backhand and I had long hair, too. So yeah, a little bit," he remarked. He saved eight break points in the second set to keep Federer at bay yet had no such gifts on his opponent's serve. He fired a backhand crosscourt into the net-bound Federer's sneakers to earn three set points in the tiebreak, then converted the first with a crushing forehand winner that kissed the line in the corner. 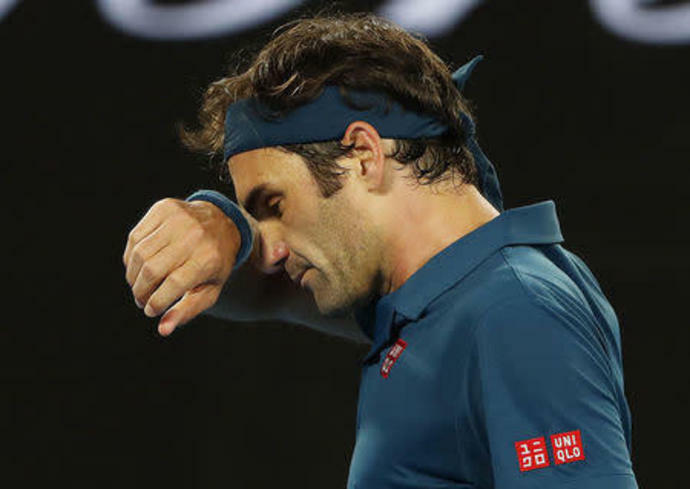 It came to a head at 6-5 down, with Federer's first serve going missing in four successive points and the set lost with a trio of unforced errors on forehand.